What’s not to love about sleep?! When we sleep well, everything seems to work better, right? I totally get that in the real world, there are things that can cause sleepless nights. We have responsibilities, busy schedules, deadlines, families; we may have endless creative ideas, feel overly excited or perhaps on the flip side, a penchant towards endless worry. We might socialise to excess or try to squeeze too much into our day putting relaxation and rest waaaay down the bottom of the to-do list. Yes, our lifestyle has the potential to play havoc with our slumber, which can in turn play havoc with our sense of well-being. Something I know all too well. After years of burning several candles at multiple ends, sleep was something that seemed to be a blessing I’d somehow lost the ability to experience. No matter how much chamomile tea I drank, valerian root I consumed, or lavender I doused on my sheets, I had more success catching colds than I did catching zzz’s. That was, until I began practicing yoga. I believe that the way we practice has as much significance as what we practice, so I’m sharing a bedtime yoga sequence that takes into account more than just going through some postures and hoping for the sandman to visit. It works for me regularly, and hope it works for you too! 1. Start Seated, With the Hands in Anjali Mudra. This is a great way to find your centre, connect with your breath and let go of the events of the day. I like to start seated in Vajrasana (kneeling with the sit bones over the heels) as it allows the digestive organs to settle and relax which is wonderful if you carry tension in that area. If this isn’t comfortable for you, come to easy cross-legged instead. Take the hands together in prayer and lightly touch the thumbs to the centre of the chest, taking a moment to acknowledge the space around the heart. Consciously think of at least 3 things you are grateful for in this moment and be with those feelings for a minute or two, or more if that feels right. Come on to hands and knees with the spine in neutral, shoulders over wrists and hips over knees. Begin to move sloooooowly (notice if your instinct is to hurry) through a few rounds of Cat and Cow. Feel the movement start from the tailbone and flow up through the spine and back again in a fluid, soothing way. I like to close my eyes and let the breath guide the movement of the body, releasing any tension or tightness in the back and/or the mind. This is one of the ultimate yoga postures for quieting, calming and restoring -- obviously excellent qualities when it comes to preparing the mind and body for sleep. The knees can be together or separate, depending on what your body wants and I’d recommend placing the arms/hands in whatever variation (arms out in front, back alongside the body, or forehead resting on your hands) is going to increase feelings of relaxation. Stay for at least 10-15 (or more) breaths, and get a sense that you’re letting go more and more with each exhalation, helping to rejuvenate and restore your whole being. Another beautiful pose to soften the edges of our day, this pose really works to quiet the mind and introvert our awareness. From seated, bring the soles of the feet together and then slide them away from your body, further than you would have them in regular Baddha Konasana. 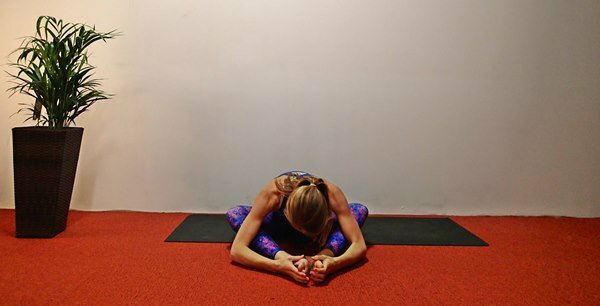 As you start to fold forward, allow your back to round and feel yourself slowly melting towards the floor. Depending on your level of flexibility, the forehead may come to rest on the hands, or maybe it comes all the way to rest on the feet. Allow yourself time to melt into the pose and use the exhalation to help you let go. After a minute or three, or an amount of time that feels intuitively right, start to slowly peel yourself up (please don’t rush). It’s nice to counter this pose with a very quiet, gentle seated backbend or gentle seated twist. 5. Vipareet Karani - Typically Between 1-10 minutes, Though Some People Prefer to Stay Longer. Legs up the wall pose is a wonderful way to finish this sequence, as it’s kinda the ultimate restorative pose. 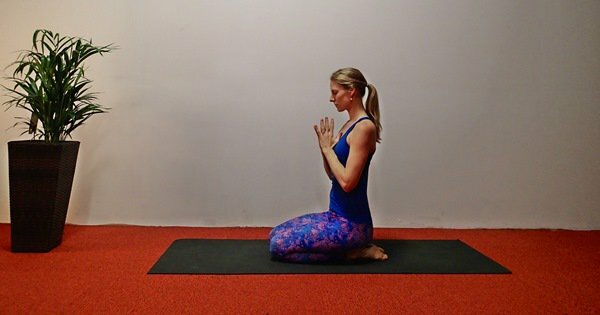 For those of you who spend a lot of time on your feet, this pose will probably start to feel incredible after a matter of seconds. 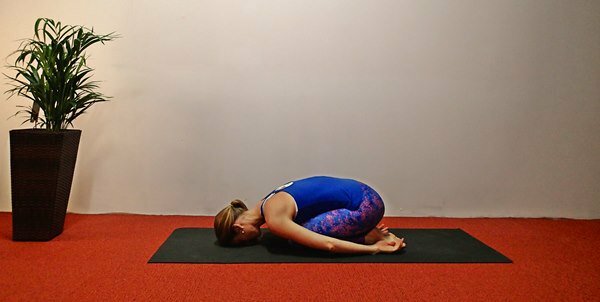 There are a couple of different ways you can practice this pose, with or without a bolster/blanket so find the option that provides the most comfort, one that your body responds to in a calm and relaxed way. The cherry on top of this sequence is crawling into bed and lying in Savasana. If you have a bed mate, ask them to support you by giving you some space (spooning is of course always an option but perhaps not for this sequence). I like to take a few moments to consciously send love and gratitude around my body, thanking it for helping me experience the day, and this simple, effective exercise sets my mind, body and soul up for a happy, peaceful slumber.